Oil and gas pipeline inspection robots, self-driving shuttle buses, and precision-focused RF sensor companies receive funding boosts this week. The shortest month ended with a bunch of robotics transactions in the world of self-driving vehicles, underwater inspection robots, and educational kits for students. Additional financial moves included investments for logistical robot systems, microlocation sensors, and a cloud-native company aiming to improve real-time applications for industrial robots and self-driving vehicles. Get ready to see some more self-driving shuttles in a city or town near you. Autonomous vehicle company May Mobility raised $11.5 million in seed funding from BMW i Ventures and Toyota AI Ventures. According to the company’s press release, the new funding lets May Mobility launch new self-driving shuttle deployments across the U.S.
Additional pilot deployments will be launched in the next few months, with May Mobility’s vehicle on display at the South by Southwest Michigan House, the Washington Traffic Safety Commission’s Traffic Safety Conference in April, and the Urban Land Institute in May. Submersible robotic inspection startup Planys Technologies raised $2.16 million in Series A funding this week. The funding round was led by Oil and Natural Gas Corporation Ltd. (ONGC) Start-up Fund and others. Launched in 2015, the company makes remotely operated vehicles (ROVs) to provide inspection and survey for underwater applications, including oil and gas pipeline inspections. According to robotics transaction trackers, Planys Technologies is looking to provide robotic inspection services in onshore locations, such as storage tanks, pipelines, and ship hulls, in addition to its offshore locations (ports, platforms, and civil structures). Startup Zededa emerged from stealth mode this week, announcing $3.06 million in seed funding to help create real-time applications at the edge of the cloud, including self-driving cars and industrial robots. The seed round was led by Wild West Capital. Other investors include Ed Zander (former CEO of Motorola and former chief operating officer of Sun Microsystems), as well as Almaz Capital and Barton Capital. The Santa Clara, Calif.-based company said it will use the funding for additional research and product development, investment in open-source projects for edge computing, and sales and marketing initiatives. Humatics Corp., which develops microlocation products, announced this week the acquisition of 5D Robotics and its subsidiary, Time Domain. Humatics makes radio-frequency (RF) sensors that can measure the position of objects in a 3D space with millimeter-scale precision from up to 30 meters away. 5D Robotics and Time Domain make similar systems that can locate objects with centimeter-scale precision, but at a longer range — up to 500 meters. Humatics said the new company will create products that measure position to help “transform industrial automation, next-generation construction, autonomous vehicles, and smart cities.” Financial terms of the deal were not disclosed. 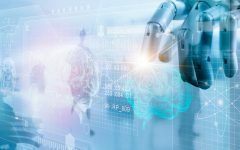 Several companies have invested in the Global X Robotics & Artificial Intelligence ETF (exchange-traded fund, NASDAQ: BOTZ) during the fourth quarter, according to Stock News Times. Wedbush Securities invested $302,000, McMillion Capital Management invested $246,000, and Traynor Capital Management invested $251,000 into the fund. In addition, two companies acquired new positions within the robotics transactions fund: Traynor Capital Management Inc. ($251,000) and SG Americas Securities LLC ($427,000). Indian startup Avishkaar Box hopes to expand its presence in India and Asia for its robotics-based educational kits, after raising Rs 5 crores (approximately $772,500) in pre-Series A round funding from Auxano Deals this week. The company makes the Avishkaar Learning Programs to help make science, technology, engineering, and math (STEM) concepts more fun and engaging for students.